“Some myths are real.” A truly atmospheric horror film, Wendigo opens with a family driving to the Catskills during the winter to spend the weekend in a rented cottage. They hit a deer on a country road and have a run-in with a bunch of yahoos straight out of Deliverance. One of the hunters, Otis (John Speredakos), is a total lunatic. The tension builds up but before you know it the family is back on their way to the cottage. Once they arrive, strange things begin to happen. Fresh bullet holes are discovered in the walls. The kid, Miles, starts seeing ghostly visions. The next day, the family travels to the town’s general store. A strange man behind the counter gives him a gift – an Indian spirit called a wendigo. Written and directed by Larry Fessenden, this truly atmospheric horror film reflects a powerful personal vision (especially during the film’s first hour). I can usually figure out where a film is going about three minutes into the thing but Wendigo had me guessing the whole time. Unfortunately, the energy and the originality from the first hour are not entirely sustained during the finale – but what the hell, it’s still 10 times better than The Blair Witch Project. The solid cast includes Jake Weber (who appeared in the 2004 Dawn of the Dead remake), Patricia Clarkson (who was also excellent in The Station Agent) and Erik Per Sullivan (“Dewey” from Malcolm in the Middle). Useless Trivia: Fessenden also wrote, directed and starred in another entertaining but overlooked 1997 horror film, Habit. 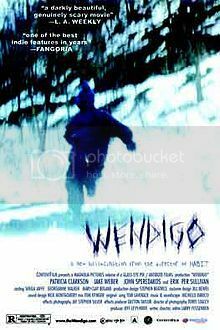 • In the DVD liner notes for Wendigo, Fessenden writes, "For me the WENDIGO is nature and fate, terrifying and tender all at once; it's a voracious cannibal, an indifferent witness, an avenging angel, a superhero, and that thing that we believe in even when we know it's not there. It shape-shifts in my own mind and remains elusive."